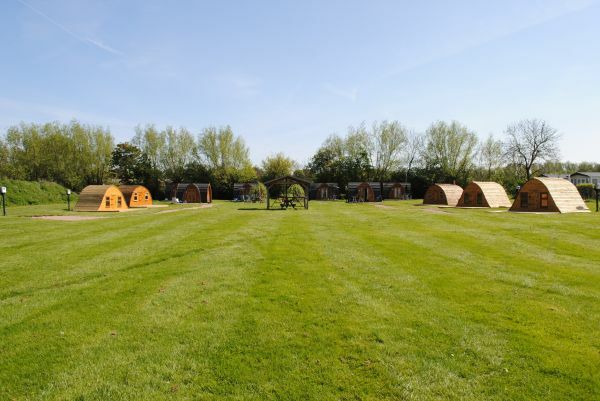 Glamping at Riverside Park is on the River Avon in the heart of the beautiful Warwickshire countryside adjacent to the village of Tiddington and approximately 1 mile from Stratford upon Avon and The Cotswolds making it an ideal base for your holiday. We pride ourselves with the David Bellamy gold award, having the advantage of open fields where you can relax by the river or play games with the children. There is a lot of wildlife around the park with Swans and Ducks being regular visitors, keep your eyes open down by the river for the Kingfishers, Buzzards, Woodpeckers & Heron. Our stunning Riverside Bar & Restaurant offering bar and dining whilst enjoying panoramic views of the River Avon and the Welcombe Hills beyond is open. Located feet from the river in its elevated position the large al fresco balcony will allow you to relax and soak up the beautiful views whether it be for a quick drink or sumptuous meal from our menu designed to suit all. Bowling green available for visitors to use on our adjacent park – Rayford Park. Our river taxi service is available daily throughout the season (weather permitting) giving you a picturesque journey into town. There is a small charge for this service which usually runs from 10am to 5pm between the site and Stratford upon Avon. There is around a mile & a half of free fishing on the River Avon for guests who are staying on at Riverside Park. The fishing season is from the 16th June to 16th March, a rod license is required. Perch, Bream, Roach, Chub, Barbel, and Pike are among the catches. 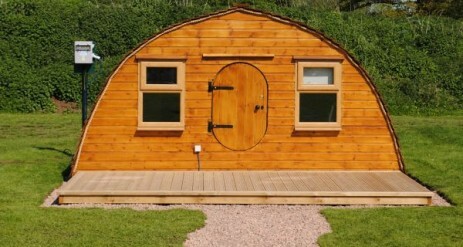 We have 3 different shapes on these,snugs sleep up to 4 people, the standard Hobbit Huts can sleep up to 4 people (same price as the snugs) and the Hobbit Hut Mini can sleep up to 3 people. Beehives sleep up to 4 people. Camping is back with a difference! The Snugs are nestling into a woodland hedge looking across the meadow to the River Avon, snugs offer an alternative to traditional camping. 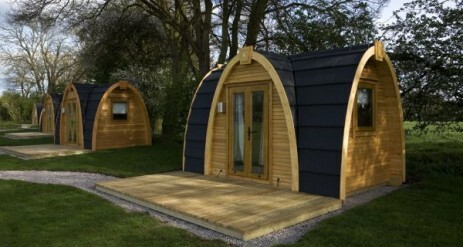 These wooden equivalents to tents are rather well built, insulated wooden huts made of larchwood, with a solid roof and extra insulation to keep you nice and snug from the elements. The lockable French doors and windows mean you can go out and explore, feeling more secure. The camping snugs have been designed to give you maximum headroom and space to accommodate up to 4 people. On one side of the snug is a sofa bed, the other side has hand crafted wooden bunks. The living space in the middle has a light, plug sockets, small heater and small fridge. 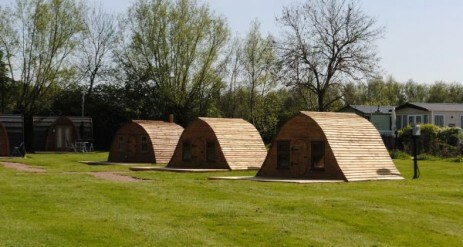 The Hobbit Huts are positioned in front of the camping snugs. 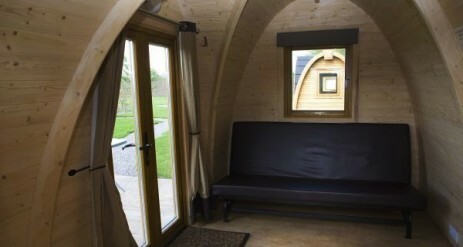 These quirky huts are different in shape, some sleep up to 4 (more suitable for 2 adults & 2 children) and the Hobbit Hut Mini sleeps up to 3 (more suitable for 2 adults & 1 child). They have the same sofa bed, fridge, heater, light and plug sockets as the snugs. 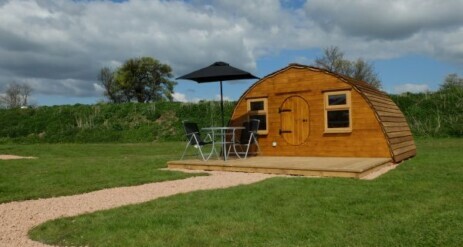 The standard hobbit hut sleeping up to 4 also have 2 single canvas camp beds whilst the hobbit hut mini sleeps up to 3 have a folding sleeper chair (cube). The beehives are a fully insulated wood clad design with a pine clad interior to give the inside a light and spacious feel. French doors lead you into an open space, where you will find a sofa bed, built in bunk beds, drop down shelf, extra storage, both hanging and under-bed storage, dimmerable LED lighting and USB connection ports. You basically need to bring everything you need for camping, minus the tent. However – if you are not a well equipped camper, all the necessary equipment for your stay can be hired in one of our ‘Camping Packs’. Please note that bedding is not supplied in the Snugs or Hobbit Huts. Pets are welcome on the park but they need to be kept on leads at all times. There is also a large dog walking area. 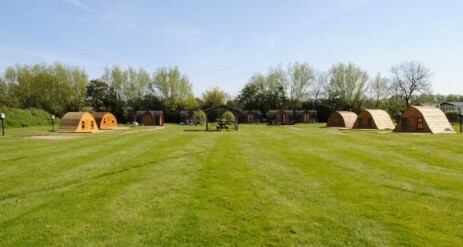 THE PARK also offers Wooden Lodges, Caravans and Luxury Cottages for hire. Please see our website for further details.